The Halloween eve passed by and pumpkin soups or pies are cooking. November, for many of us, is synonym of grey days and frisky evenings. So what better than a selection of games to enjoy with friends and family this weekend? 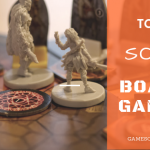 Zombies, vampires, ghosts and other ghouls are some of the recurrent characters in board games. Usually, they suffer a gruesome death under the weapons of the adventurers we all are. Let’s have a peek at what we could play this weekend, with 5 games fitting this holiday’s spirit. On Halloween night, it is customary to organize a party in your big dark castle. And you really want your party to be the best. So make sure to invite the vampires, ghosts and monsters. Beware as some guests may take away your friends. Knock! Knock! is a card game, played from 3 to 6 players in about 20 minutes. On his turn, a player will chose one of the cards from his hand, place it face down at the door of another player and will knock on the table. What an ominous sound. The party organizer will be faced with a tough choice: will he open the door, and accept the guest in his party, or leave the door shut, sending the guest back to the other player? Why is this a tough choice? Well simply because different cards have different actions. You may either turn down some points or accept a card that will ruin your party. Braaains! If Georges Romero taught us something, this is that Zombies eat brains. And that a shotgun in their head will stop them. And that if you don’t have a shotgun, then run away. And find a shotgun. In zombie dice, you are actually a hungry zombie. Alongside with your friends – the game is played from 2 to 8 players, or more if you really want. And you will be rolling dice for brains, and making sure not to be killed. The cup contains 13 dice, green, yellow and red. Every dice have number of brains, footsteps and shotguns. The green are most likely to give you brains, the red will get you hit. Randomly pick 3 dice, throw them. Put every brain aside – yummy! – and shots – aoutch! -. Footsteps remain on the table. Do you want to go again? Pick any footstep previously thrown and randomly add enough dice to have 3 dice in hand. Throw. Repeat. If at any point you chose to stop, the brains will go towards your scoring. But if you get shot 3 times, you don’t score this round. Pass the cup to the next player. The first player with 13 points will trigger the end game. Keep throwing until his/her turn comes again. Still in the lead? We have a winner. Else, repeat until a score leader is still up after a full round. 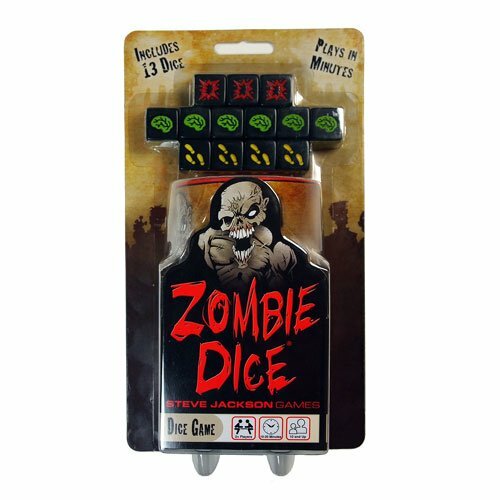 Zombie dice is a fast game, usually played under 20 minutes and will call the best of your judgement and luck. Sunnydale is again in danger. A big bad is trying to take over the city. Only Buffy and her friends may stop him. Vampires, ghosts and other demons roam free and the citizen of Sunnydale may fall victim if nothing is done to stop the big bad. 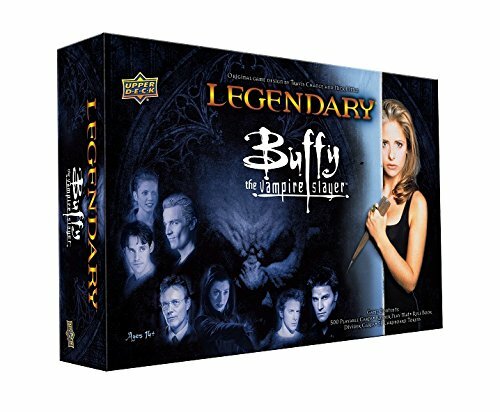 Legendary Buffy is a deck-building game. Every turn, with 6 cards in hand, players will advance the plot, revealing a new enemy roaming the streets of the city. They will then have the chance to either recruit new allies, powerful characters, friends of Buffy, or fight the evil – either enemies or even the big bad. The big bad has a scheme in mind – ways to impact the game play and win the game. Make sure your team will defeat the big bad before it’s too late. From 1 to 5 players, Legendary Buffy the Vampire Slayer is a game played up to 60 minutes. The rules are simple to explain and the level of difficulty is enough to offer a real challenge without being unforgiving to new players. If you have not yet experienced the Legendary game system (Legendary Marvel or Legendary Encounter such as Alien, Predator, Firefly, X-Files), this box may be a perfect gateway into this deck-building system. The 15 heroes and 5 Big Bads in this 500 cards set will help you revive the adventures of the most badass heroin of the end of the 90s. What would Halloween be without a real infestation of zombies? And your friends and yourself will have to cooperate to survive. Get ready for Zombie 15′. Zombie 15′ is a big box, packed with miniatures. And tiles. And cards. Everyone above 18 has turned into one of those tireless brain eaters. A small group of teens try to survive the relentless horde of zombies. The game is scenario based – you will select and position tiles at the start of the game depending on the chosen scenario. The game will then lead you into discovering the truth about the events that triggered this apocalyptic world. But be quick: time is scarce. In every game, you will only have 15 minutes to reach the end. Or die. A soundtrack will help you feel the urgency of the moment. 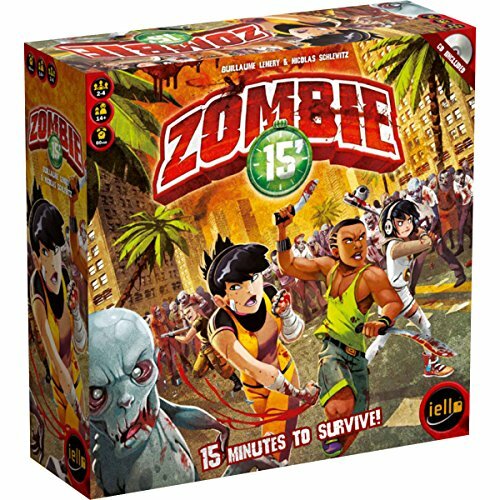 Zombie 15′ is a great cooperative game: it is a bit tedious to set up, locating the tiles and cards for a 15 minutes game may sometimes feel annoying. But once you are in the game, you very quickly forget about that. You will have to go through a learning curve, in this 2 to 4 players game, starting from 14 years old. Taking your actions on time, and efficiently under the stress of the moment is a teaching experience. Will you manage to go through the 15 scenarios included? Back in 1984, aired the first Ghostbusters movie. Bill Murray and Sigourney Weaver, among others, were fighting their way to rid New York City of an invasion of ghosts. Peter Venkman, Ray Stantz and Egon Spengler formed the trio known as The Ghostbusters. When there’s something strange in your neighborhood, only one number: Ghostbusters 555-2368! Is it not a perfect universe to explore for the most ghostly of holidays? 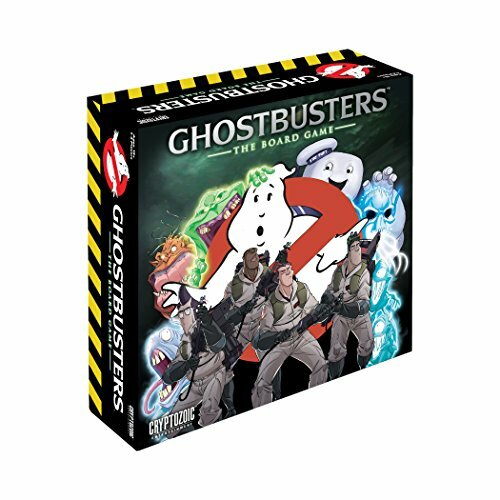 Ghostbusters, by Cryptozoic, is a miniature board game, played from 1 to 4 players. Between 30 and 120 minutes, you will be making your way through multiple scenarios leading you through the major events of the first movie. This game is packed with over 40 miniatures and you will be immersed in the invaded New York City. Will you manage to catch Slimer? Will you defeat Stay Puft Marshmallow Man? Make sure to cooperate and gain the experience points that will facilitate your actions. Hop on board of the Ecto-1, gear up and send those spirits back to the dimension where they belong. And don’t forget to seal the gates, otherwise, the infestation will never stop. Men In Black / Ghostbusters - Ecto-Terrestrial Invasion.